Superfighters is an interesting flash fighting, platformer game that was created by MythoLogic Interactive (program by Alexander Siigur, with design and art made by Johan Hjarpe and music made by Hzlancer). 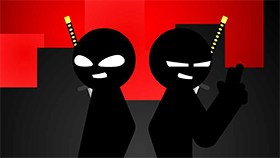 This is the first installment in series Superfighter games and was released in 2010 using Adobe Flash Player. After the success of Superfighters game, the group of developer decided to create the new installments for it. They are Superfighters Deluxe and Superfighters 2 Ultimate. Superfighters Deluxe is the sequel of the Superfighters game that was created to respond to the growing demand for an online version of its original game. This game project was moved from Adobe Flash Player to Microsoft XNA Framework and released on July 14th, 2012. You can purchase this game on Steam. Superfighters 2 Ultimate is also another sequel of Superfighters game. This game is the updated version of the original game and just released in January 2018. In this game, the main mission of players is to kill all enemies on the map and thus win the game by using different weapons. You can use different sauces such as stealthily sniping enemies from afar, take down many enemies at the same time by using explosives or shoot down opponents using powerful guns, etc. In addition, you can carry with your one melee weapon, one gun and one grenade at a time. To replace a weapon in one of these slots, duck and press the melee key when near a weapon. On the stages, there will be obstacles like explosive crates, making it so that you have to be careful when you get close to them as you can be burnt and lose health when it explodes. You can also break wooden crates, roadblock bars... to move forward. There will be random weapons lying around the stage that you can pick up and use in the match. Remember that when using a gun, you have to aim and shoot because if not, the gun will only fire in a straight line. Besides that, there are three basic modes in this game including VS mode, stage mode, and survival mode. In each mode, the gameplay and strategy have a bit different. However, the main mission of players is still to eliminate opposition players to become the winner. In general, this game like a hearty meal of fighting and your main task is to enjoy it all. VS mode: This is the first mode in this game and here, you fight against up to 7 opponents and can choose the stage that you want to fight in. They are Jonhny, Boris, Agent, Billy, Scott, Mac, and Jeff. In addition, you also can choose the number of opponents in each match. And of course, the maximum number is 7 opponents. This is an infinite mode, so, you can play freely. However, tactics are always encouraged. Stage mode: This is a quite interesting mode and it is divided into 12 different maps. These maps are divided into three different skins including Bronze, Silver, and Gold. Each skin consists of three maps. The main mission of players is to finish all the challenges to unlock a new player skin. There are also 7 opponents in this mode and they are the familiar character that appeared in the VS mode. Besides that, lots of explosives appear in this mode and they can be explosive anytime when having the impaction of external forces. Survival Mode: This is the most difficult mode in this game. In this mode, you’ll fight wave after wave of enemies with a time limit, so, you must try to defeat the enemies as quick as you can. And of course, tactics are almost required if you want to win. Because this is a really hard mode, so, if you are a newbie, at first, let's try with the VS or stage mode. Player 1 use N and Player 2 use 1 to punch. Player 1 use “,” and Player 2 use 3 to throw grenade. Player 1 use M and Player 2 use 2 to shoot. Player 1 use “.” and Player 2 use 4 to power up. Play Superfighters full screen to have the best experience. There are lots of tips in this game. Besides that, before entering a match, the game will show you a tips for that match, so, read detail about these tips and do follow it. You can use the boxes, filing cabinets and other solid objects to hide. Be careful with the explosives that near you when fighting against the opponent because the can be explosive and make you hurt. With addictive gameplay, surely you shouldn't miss an interesting game like Superfighters. In case you love this game and are looking for somewhere that provide this game with unblocked version, then Freegames66 is the right place for you. On this site, we offer Superfighters unblocked full-screen version for free. So, you can visit our site and enjoy your favorite game anywhere you want as long as you are connecting to the internet. Now, don't wast any minute! Let's jump into this game and enjoy a big and hearty meal of fighting and fighting. Good luck!